"Finished Basement with 2nd Kitchen"
One look and you are going to fall in Love! 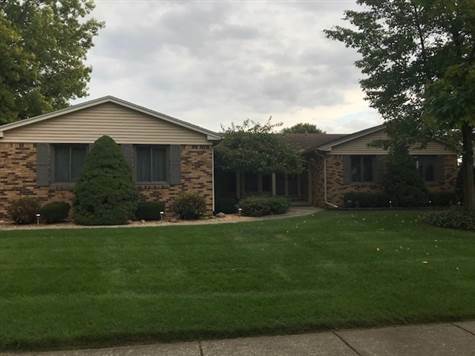 Check out this beautiful 3 bedroom 3 and half bath brick ranch located in highly sought after Plymouth Trailwood sub. This home features spacious room sizes, a gorgeous kitchen with Corian counters and light oak cabinets, double front doors with a huge foyer and hardwood floor,a gigantic finished basement with a second full kitchen including a second dishwasher, another living area/rec.area big enough for the pool/ping pong table. Also in the basement is another full bath and work shop space. The WOW! on this home is the awesome raised brick paver patio and walkway around the house. You can sit on this patio and enjoy the retractable awning and over look the professionally landscaped yard. More flowers than you can imagine. Make an appointment to see this home today!